I did a Modern Grid card similar to this one last year using Stampin' Up! 's Jolliest Time of the Year. 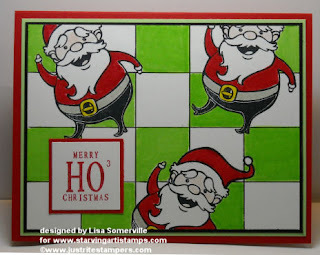 For this card I used the Santa from Starving Artistamps - Santa's Sweet Shoppe. Kinda looks like Santa is out dancing! I created the sentiment using my JustRite Small Letter Set for Round Monogram Stamper, Harmony Rectangular Stamper Set, and Times New Roman Paper Crafting Font Ensemble. The "Merry", "Christmas" and "3" are all part of the Small Letter Set, the "HO" is using the Times New Roman Font. By placing them on the Harmony Rectangular I'm able to stamp them just like if I was using a stamp on a wood block - allowing proper placement to get my text straight on my card stock. After stamping, I cut it down to size, then layered it onto my red rectangle then on my card stock as shown. I love this! Those santas are so cute and fit this technique so well. Love the bright green! So bright and colorful Lisa... Your santa is quite Merry! I love the card!